What is authentic education? For that matter, what is a school? And what is a teacher? Over the last few decades, the American classroom has undergone a shift of enormous magnitude and the consequences of this are truly beginning to make themselves known. 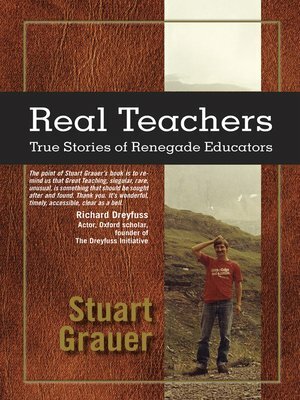 In Stuart Grauer's collection of true, short stories, Real Teachers, we are asked to consider the goals of contemporary education and ask: Is this what a school should be? Is this all a school can be? In Real Teachers, Grauer asks us to embrace discovery, individuality, perseverance, and possibility—to reconsider large class size, standardization, culture bias, "risk-free" schooling, and the sterilization of the curriculum. Through these stories of revitalization and a return to the roots of our culture and education, Grauer imparts a valuable lesson, incredibly relevant in this time where education is misunderstood, teaching is abused, and our students fall by the wayside. Real Teachers is a call to action, a call for change, and for a return to the community-oriented, regional education which was once dominant in our schools. Through this collection, Grauer invites us into the history of his life, his personal discoveries—his road to the growth that made him a real teacher.